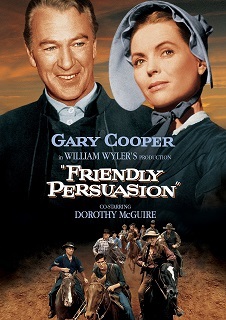 Gary Cooper stars along with Dorothy McGuire and Anthony Perkins in William Wyler’s uplifting film Friendly Persuasion, presented by Ogunquit Performing Arts, Sunday, March 4 at 2:00 pm in the Dunaway Center, 23 School Street, Ogunquit. Free admission, parking and popcorn. The fifth film in Ogunquit Performing Arts’ Classic Film Series is Friendly Persuasion, William Wyler’s beautifully made film about a Quaker family whose values are tested during the Civil War. The film stars Gary Cooper, Dorothy McGuire and Anthony Perkins, all delivering warm and winning performances. The film will be screened on Sunday, March 4, 2018 at 2:00 pm on the Dunaway Center’s wall-sized screen, 23 School Street in Ogunquit. Admission, parking and popcorn are free. Friendly Persuasion (1956) focuses on the Birdwells, a peaceful family of Quakers who are thrust into the Civil War when a band of Confederates known as Morgan’s Raiders threatens their town. The eldest son, Josh, (Anthony Perkins) hears a plea for young men to help fight off the marauders and begins to question the anti-war, anti-violence values of his religion. His mother Eliza (Dorothy McGuire) is against him going to battle, but his father, Jess, (Gary Cooper), a man of moral courage and understanding, recognizes his son’s need to work out his conflict and side with a just cause. When Josh is wounded in battle, his father goes into the war zone to save him. What he encounters there tests his faith and a way of life that will never be quite the same. Producer-director William Wyler had author Jessamyn West’s novel Friendly Persuasion in mind for eight years before he brought the project to Allied Artists. They gave him a $1.5 million budget for his first color film, and shooting was to take place in the story’s original southern Indiana locale. By the time it was completed, on a San Fernando Valley estate and at the old Republic studios, the cost had swelled to $3 million. A critical and financial success, the film brought in $8 million in box-office receipts by 1960 alone. Friendly Persuasion was the first film to cast Gary Cooper as a parent with grown children and gave him one of his best late career roles. The internal conflicts as Jess Birdwell struggles with his son’s decision to forsake his Quaker faith to fight in the Civil War and his own urge to avenge a friend’s death in battle provided a perfect vehicle for his simple, understated acting style. Wyler had always thought Gary Cooper the perfect actor for the part. Although the actor was reluctant to undertake his first father role, he finally gave in after West took him to a Society of Friends prayer meeting. The stillness made him think he could capture the character’s spiritual nature. Wyler’s dream casting for Cooper’s wife was Katharine Hepburn, but she wasn’t available. Many others were considered, and Wyler actually tested Maureen O’Hara and Eleanor Parker before casting Dorothy McGuire. While scouting talent in New York, Wyler saw several young actors for the role of Cooper’s conflicted son, including Anthony Perkins, who had only done one previous film. Wyler was so impressed with Perkins’s insights into the character and his reading that he cast him without bothering to make a screen test. The excellent supporting cast includes Marjorie Main, Richard Eyer, Robert Middleton, Phyllis Love, Mark Richman, and Joel Fluellen. Join us for this heartwarming film on Sunday, March 4, 2018 at 2 pm. Friendly Persuasion is shown on a full wall-size screen, admission, parking, and popcorn are free!